Moments after Wes Anderson’s The Grand Budapest Hotel was over, I wanted to see it again. Chock full of style and humor, it’s a movie that practically demands multiple viewings, and is so entertaining that you don’t mind watching it more than once. An author (Tom Wilkinson) talks of the events that led to the writing of his most popular book. Told in flashback, we join him when, as a younger man (played by Jude Law), he resided at the nearly deserted Grand Budapest Hotel, which had once been the Republic of Zubrowka’s most popular lodgings. One day, he has a chance encounter with Zero Moustafa (F. Murray Abraham), the elderly owner of the hotel, who invites the author to dinner. Over the course of their evening together, Moustafa recounts his early days as a lobby boy at the Grand Budapest (the younger Zero is portrayed by Tony Revolori), when he was mentored by M. Gustave (Ralph Fiennes), the refined concierge who oversaw the hotel in its heyday, just before the outbreak of a costly World War. Along with his many duties, Monsieur Gustave would personally see to the happiness and well-being of the wealthy old ladies who frequented the Grand Budapest. One such woman, Madame M. (Tilda Swinton, in heavy make-up), with whom Gustave had a very special relationship, passes away, and in her will leaves the concierge a priceless painting titled “Boy with Apple”. This doesn’t sit well with Madame M’s son, Dmitri (Adrian Brody), who orders his right-hand man Jopling (Willem Dafoe) to frame Gustave for murder. Accused of poisoning Madame M. for his own personal gain, Gustave is shipped off to prison, but with the help of his trusty lobby boy Zero, as well as Zero’s young fiancé Agatha (Saoirse Ronan), he intends to prove his innocence and, if possible, bring his accusers to justice. You can always rely on Wes Anderson to create a visually interesting film, and The Grand Budapest Hotel is arguably his most stunning achievement to date. With its painted backgrounds and old-world locations, the movie has a very European feel, a change of pace for the director, whose previous films put the focus squarely on American intellectuals. 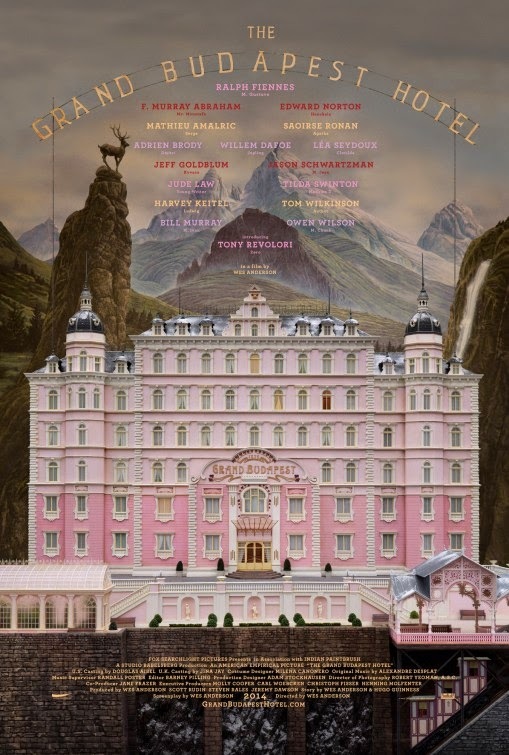 The Grand Budapest Hotel also features an impressive cast, including F. Murray Abraham (as the melancholy older version of Zero the lobby buy); Edward Norton (the local military commander); Bill Murray (a concierge who assists Gustave in his time of need); and Harvey Keitel (a fellow inmate of Gustave’s who’s devised a plan to escape the “impenetrable” prison where they’re being held). Yet, despite its phenomenal supporting crew, it’s the movie’s lead, Ralph Fiennes, who delivers its best performance (I honestly didn’t know he could be as witty as he was in this picture). Along with the humor, The Grand Budapest Hotel is, at times, quite exciting; the scene in which Gustave and several other inmates try to escape from prison is both tense and exhilarating, yet it’s the film’s snowbound chase scene (where two characters on a sled pursue a third on skis) that’s easily its most thrilling. Critics have called The Grand Budapest Hotel a masterpiece, and it’s been nominated for a number of awards (including 9 Oscar nods and a Golden Globe win as the year’s Best Picture in the comedy / musical category). Personally, I have a hard time ranking this movie over The Royal Tenenbaums, which is one of my all-time favorite films. But to be honest, I can’t say with any certainty I’ll always feel this way. It’s possible that, the more I see The Grand Budapest Hotel, the more I’ll fall in love with it. I enjoyed this movie, but I adored Moonrise Kingdom and therefore, perhaps unfairly, was somewhat disappointed by this one (though I did enjoy it). I agree completely about Fiennes, by the way. He is a delight from beginning to end. A fairytale for adults, this is Anderson's über-film thus far, utilizing the entire breadth and astonishing depth of his imagination to bear exquisite humour and life in every single, immaculately composed shot.